Macaroni and Cheese. What’s not to love? It’s truly the ultimate in comfort food. This 3 Cheese Macaroni and Cheese is made with a blend of shredded Fontina, White Cheddar and Sharp Cheddar Cheeses, a creamy, extra cheesy sauce and an additional heavy sprinkling of Sharp Cheddar over the top. It’s hard to eat just one bowl, trust me. About 26 years ago, when my first son was born, I was given my very first slow cooker from a friend. Although I didn’t know it then, I realized soon after that my slow cooker would become the most valued appliance in my kitchen. Think about it, you add all of the ingredients into the slow cooker in the morning, set it and literally forget about it. The amazing aromas floating from your kitchen remind you that dinner is cooking and you are off making the most of your day. About a year ago, the lid broke on my old slow cooker and for some reason, I never bought a new one. Life got busy again and I honestly forgot about it. As luck would have it, Hamilton Beach reached out to me a few weeks ago to see if I would like to try their Programmable Stay or Go 6 QT Slow Cooker and I jumped at the chance. The very first recipe I made in my new slow cooker was this creamy and very cheesy Macaroni and Cheese. It’s a recipe I have made many times when my children were younger. My family has always loved how creamy and loaded with cheese this special mac and cheese is and I love the fact that I can put this dish together in minutes. It’s so easy to make and it’s perfect for weeknight family dinners or weekend entertaining. This 3 Cheese Macaroni and Cheese is still one of my family’s favorite meals. It begins with already cooked noodles and to the noodles I add melted butter, the three cheeses, eggs, sour cream, spices, milk and a homemade variation of Mornay Sauce. Mornay sauce is a simple white sauce which is typically made with Swiss cheese and/or Parmesan. For this macaroni and cheese recipe, I chose to substitute shredded sharp cheddar cheese to enhance the cheddar flavor. The first step to making the sauce is to make the roux, which is simply combining melted butter with flour. After stirring and cooking for about 2 to 3 minutes, whisk in milk and continue whisking until the sauce thickens, which will happen quickly. Simmer for a few additional minutes, then stir in the shredded cheddar. Easy, right? The sauce can even be made a day ahead of time and kept in the refrigerator until you’re ready for it. I really love my new Hamilton Beach Slow Cooker. It’s the perfect size for a 6 pound chicken or a 4 pound roast and it features a single clip that quickly seals the lid onto the base to reduce messy spills. The lid is hinged and stays up easily but will detach for dishwasher cleanup. This slow cooker has flexible programing options and you can select 2, 4, 6, 8, or 10 hours of cooking time. Another huge plus is that it automatically switches to warm after cooking. A slow cooker can be your best friend in the kitchen. It’s perfect if you’re cooking for a family or if you’re cooking for one. It’s the easiest way to prepare dinner and takes no effort at all. I’m so happy to be partnering with Hamilton Beach on this post. Thank you so much for supporting the brands we so carefully choose to work with. All opinions expressed are our own. Thanks for reading! Are you following us on Pinterest, Facebook, Twitter or Instagram? We’d love to connect, drop by and say hello! If you’d like to read more from ZagLeft, be sure to subscribe to never miss a post! As a gift to our readers, subscribers can receive a FREE copy of our eCookbook, College Meals – 30 Days of Recipes! It’s a great gift to give to any college student in your life or even to give to yourself! This 3 Cheese Macaroni and Cheese with a blend of shredded Fontina, White Cheddar and Sharp Cheddar Cheeses. It's hard to eat just one bowl, trust me. In a small saucepan, melt the butter over low heat. Increase the heat to medium and blend in the flour. Cook slowly, stirring, until the butter and flour cook together for 2 minutes (do not allow the roux to brown). Slowly whisk in the milk and continue to whisk until the sauce thickens and comes to a boil, about 2 to 3 minutes. Reduce heat to a simmer and stir in the cheese. Continue to cook, stirring until thickened, about 5 minutes. Remove from heat. Set aside. In a large pot of boiling water, cook the macaroni to al dente. In the slow cooker, combine the butter, 2 cups of the shredded Cheddar, the Fontina, the White Cheddar cheeses, the eggs, and the sour cream together. Slowly stir in the milk, dry mustard, salt, and pepper. Add the drained macaroni and stir again. Top with the additional cup of shredded cheddar cheese. Set the slow cooker on low setting and cook for 3 hours, stirring occasionally. I love all the cheese in this recipe. Sounds like the perfect mac & cheese. Thank you – it’s so good, Christie. My family would be happy if I made it every night. I could definitely use a new slow cooker. I have had mine since we were married and it has seen better days. Your mac n cheese looks pretty incredible! What a great gift to give your family members, Kacey. If you love creamy and cheesy mac and cheese, I’ll bet you’ll love this recipe. My family sure does 🙂 – If you make it, I’d love to know what you think. I love to make barbecue chicken in a crockpot! I pour dr pepper all over a frozen chicken breast and I had different seasonings.. It’s So easy and everyone in my family loves it. That sounds so good, Kristin. I love making chicken in my slow cooker. That looks like a delicious dinner that would be perfect for a family of boys! I’ll definitely have to try this recipe! Thanks for sharing. Looks perfectly cheesy to the max!! It sure is, thanks Gerry! My favorite meal to cook in the slow cooker is green chicken stew. Ellie, that sounds delicious! Thank you. My favorite meal to make in the slow cooker is chicken wild rice soup! My favorite meal to make in a slow cooker is to make loaded potato soup! That sounds so good, Stephanie. Thank you. 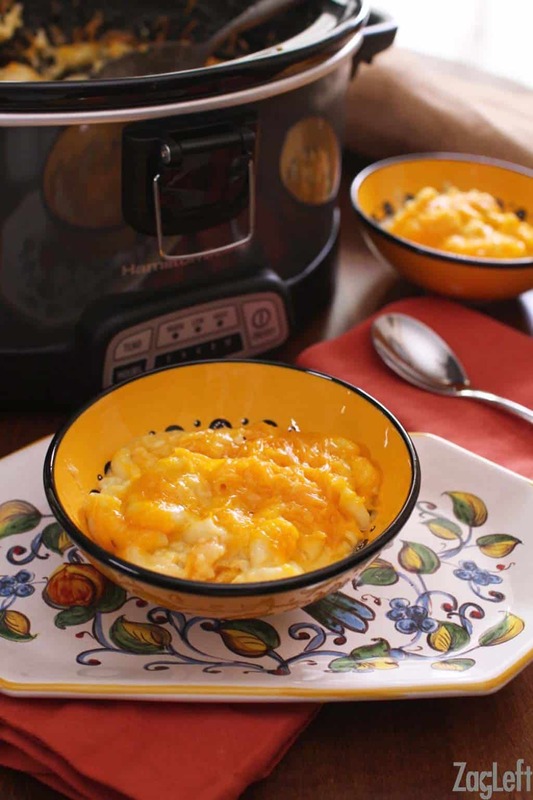 I’ve never thought to make macaroni cheese in my slow cooker, what a great idea! Thanks, Kimberly. Mac and Cheese is probably my favorite meal to make in mine. My favorite meal to slow cook would be beef stew, as it makes the house smell delicious and everyone loves it! I love how the house smells when I’ve got something cooking in my slow cooker. Beef Stew would be absolutely delicious! I’ve never made macaroni and cheese in the slow cooker before! It looks so creamy and delicious! I’ve never tried doing mac and cheese in the slow cooker but it looks great! This would be an easy, comforting meal for the kids before they head out trick or treating on Halloween. That’s a great idea, Valerie. It would be perfect to serve out before the kids go trick or treating. I love using slow cookers to make dinner. My favorite meal to fix that way is probably ham and beans. I haven’t made many pasta dishes in the slow cooker, but your macaroni and cheese sounds delicious! Thank you, Kristen. You can’t go wrong with ham and beans, I know that tastes great. Hi Joanie! I am amazed at this!! Mac and cheese in the slow cooker?! I’ve gotta try this! Sandra, it’s so creamy, cheesy and so easy to make. Hope you give it a try. My fave meal in a slow cooker is chicken thighs, but now I am sorely tempted by your mac ‘n cheese! Thanks, Dorothy! Chicken thighs in a slow cooker is one of my favorites too. Oh wow! This looks amazing. Love that it uses three cheeses. Yes, you’re right. The slow cooker is the most valuable appliance out there! I love my slow cooker too! And this Mac and Cheese will surely hit the spot at my house! Can’t wait to try this! This looks super cheesy and delicious! Oh that looks amazing! I love this idea, and what a perfect fall comfort food! I love using my crockpot (with shhh the broken lid) to make pulled pork. I could go for some right now in fact! My favorite meal to cook in the slow cooker is pot roast. I like to make Slow Cooker Tuscan Chicken Stew. I love to cook beef and pork because the results I obtain after cooking are amazing. The flavor is the best! This looks so delicious! Thanks for sharing! My favorite meal from the crockpot is meat sauce for pasta. I’ve never been a fan of meatballs but love a thick tomato sauce with ground beef, kielbasa, etc. I love to make roasts in a slow cooker. I had no idea you could make Mac&Cheese in a slow cooker! Score! I love making smoked turkey & white bean soup. Mac and cheese is one of my favourite comfort meals, and this one looks absolutely delicious! It’s hard to choose which is my favorite. I like to make a pulled pork for my husband who is from North Carolina. He seems to like it. We make cube steak in the slow cooker and man is it tasty! My favorite meal to make in the slow cooker would have to be bbq ribs, they come out better than when I bake them. I have always baked my macaroni and cheese but I will definitely have to try this out. I like pot roast and veggies – YUM! What an awesome recipe, we love mac n cheese in the crockpot, and I’ll certainly have to try this one, its similar to one I often use, but I’m always up for a new take. I love making Mexican Chicken in the crockpot – its only three ingredients – win! My favoeute slow cooker meal is likely chili. I live in the Midwest and on a cool fall or cold winter evening nothing hits the spot like chili. Hubby loves deer chili and I add sausage to make a bit more flavorful. It comes out great. I love a good old fashioned beef roast with vegetables. Not only does it smell great buy it tastes great. This looks delicious – and the fact that it is made using a slow cooker – even better! Basalmic Pork, I really don’t like Basalmic Vinegar but I love this dish! So fun Joanie! I used to make crockpot Mac and cheese for an all day scrapbook party every New Year’s Day! Mitch is looking over my shoulder, whispering “yeah…USED TO.” Guess I better get to making some again!